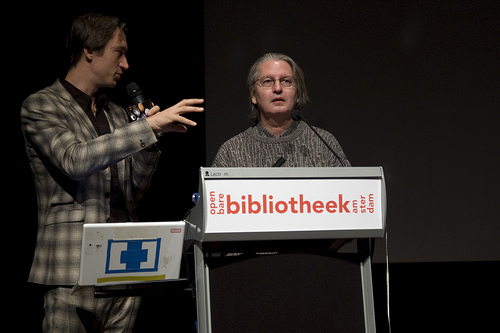 Friday October 31 the –free- Moving Movie Industry Conference organized by the Stifo@Sandberg took place at the theater in the Public Library in Amsterdam. It was a full days program with different speakers around the theme of how new media are influencing the moving image and the other way around. After a short introduction and welcome by Hans Maarten van den Brink (Stifo) and Koert van Mensvoort (Moderator) Bruce Sterling, currently working at the Sandberg Institute as visionary in residence, offered us a quadrant of 4 different possible scenario’s for the future: Bollywood, Scarcity Renaissance, Worm World and YouTube 3.0. The future, he lectured, is not something to predict, but is influenced by our ideas about it. Filmmakers are worried about this future, what worries them? The changes in technology scare them, with on one site the hackers and on the other site the lawyers, Youtube, digital movies, the world is changing and so is cinema. What is film in these days? Is it video? Is it peer to peer, is it open content, is it hand held design? Is it gaming? The future of cinema is best to be seen in the quadrant. First there is the low technology and low social reaction. Sterling exemplified this with Bollywood, the cinema of the poor as being the most influential cinema in the non-western world. The second scenario is low in technology and high in reaction where the regulators step in to create a Scarcity Renaissance. Import export barriers, banks getting nationalized, internet becomes unstable, Hollywood goes broke and the Americans flock to Europe. The third scenario contains high technology with low reaction and this is where the new media schemes are popping up. Cellphones and networked toys are everywhere and the authorities simply give up. Sterling calls this Worm World. Copyrights explode and video is on every corner. The professional is overwhelmed by thieves, amateurs and cheap software: a million movies for a dollar. The cinema system is dead and is vanishing from the landscape full of creative distractions. The last scenario is high technology with high reaction. Here cinema is in a major technological revolution and all think it is important. Sterling calls this Youtube 3.0. Social energies are focused on design. Video streams are everywhere, cinema is the billboard of new energies. The world is full of young artists with new messages, new techniques. Youtube 3.0 is now for everyone. Doorbells have videos so does your dog and even your bicycle. Sterling’s notion is that all the four scenario’s will happen since they are all aspects of our own world. All these worlds will come true. Question is, what can you do in all four circumstances. If you want to survive, stay somewhere near the center, near the axis of the events. This way you will be part of whatever will happen but, this is not the place of success. It is a safe position but not the position of leadership, you cannot change anything from here. The other position is to choose the avantgarde and make a deliberate choice in one direction. But, Sterling warns, don’t go too far, stay a little behind, be kind to other people, and tell them to come with you, that your side is the position of the megahit, the dominant future. In the Q&A off course was asked which of the scenario’s Sterling would choose. After explaining that he would like to try them all by making a grand tour he suggested that Bollywood would be maybe the most interesting. On the question if the filmmakers of today still would be able to use their talents if the means of production change he answered: ‘No he would not. There are no Bollywood Truffaut’s and you would not survive in there. Sterling’s advice is to pick the scenario that is the most strange, the one you don’t understand: try to avoid to get blindsided. If you find someone that provokes you, he has to become your friend, work your way through it. With this piece of sound advice, we moved on the next speaker, Julian Bleecker . 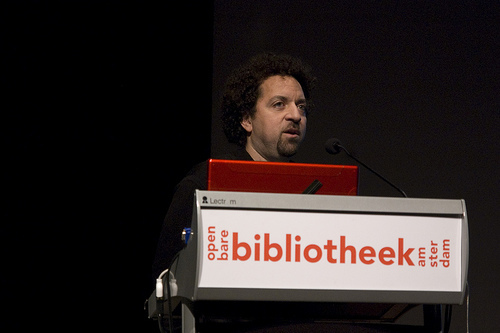 Julian Bleecker (USA) is addressing how science fiction can swap properties with science fact and how ideas can get meddled together. A science fiction writer can tell about possible futures and describe the world of these possible futures. Bleecker is using the example of the Minority Report human-computer interface to show what other science fiction/science fact representations can be found when searching in Google. There are many: Bleecker shows that besides actual moments from the film, there are other pictures that consist of a mixure of design and fiction: the science-fiction Minority report’s interface seems to have transformed into a science fact. But, not as well designed and much less persuasive as the science-fiction version. The representation of the possible future is maybe better imagined by the film world than by science. The film world has a much bigger audience and they have better means to create this representation while for a scientist it is hard to exhibit some aspects of science in an interesting way. The design for the Minority Report’s interface is based on emerging technologies in reality. So fact and fiction are influencing each other. According to Bleecker Science Fiction helps you to image a possible future: ‘I saw the film now lets talk about the real stuff, lobotomizing your imagination’. But, the problem is, when looking at interface presentations at Siggraph, the Minority Report people are doing a much better job than the science people: their representations are horrible. If the scientists were better filmmakers their ideas would share better as an imagined future. You have to find ways to express ideas. Bleecker’s suggestion is to make the scientists part of the film world to expand the realm of possible futures and to create new engineering possibilities. Science fiction can do things that science facts cannot do very easily. Props and prototypes can swap properties. Like Hitchcock’s MacGuffin is shaping the story and draws you into it, the scientific prototypes should do this too, they should move things ahead. A collaboration among science fact and science fiction can lead to more production, to more imagined future worlds. 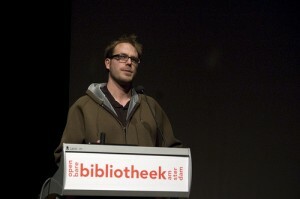 The next speaker is Jan-Bart van Beek from Guerilla Games. He tells us that there is a long relationship between games and film and they start looking like at each other more and more. The first game developed after film is ET. The game developers like the movie industry because they have the glamor and the money to create exposure. Van Beek is addressing the relation between violence and games and he explains that they are inseparable. You have two forms of entertainment. First there are the passive forms like books, music, theater and movies and second there are the interactive playthings. In this category you first find single plaything, some kind of a toy where are no rules involved. Second, you can create a goal so you have a puzzle. Then, when you introduce the aspect of competition it becomes a game, like chess. This is already an aggressive play to defeat the opponent. So challenge, reward, risk, conflict are all part of the game, otherwise it becomes a toy. A good game consists of a number of qualities: quality of the goal (its should be clear what to do), quality of the rules, quality of the challenge, quality of the competitors, and quality of rewards. Van Beek shows us how films and games start to influence each other and that there are more and more stylistic cross-overs. The tools they use are cross-over’s as well. He shows the example of Joseph Kosinki’s Hummer commercial where game tools have been used. Some film directors are also using game techniques to enhance the level of immersion. For example the Children of Men (Alfonso Cuaron, 2006) is a film that makes use of game techniques like long tracks without any editing and first-person perspective for maximum immersion. Also in the Nike commercial made by Guy Ritchy (2008) they used this technique: ‘Hey, they actually made soccer look exciting’ as the American reaction was. Another example in the commercial area is the Coca cola commercial from 2006 that is based on Grand Car Theft. The originally extremely aggressive game-character is now turned into this amazingly friendly and caring person where- you give a little love and it all comes back to you-is the final payoff. In the Q&A there were a few questions concerning the narrativity in games. Some people from the audience wondered why games were so plot based and not character based. 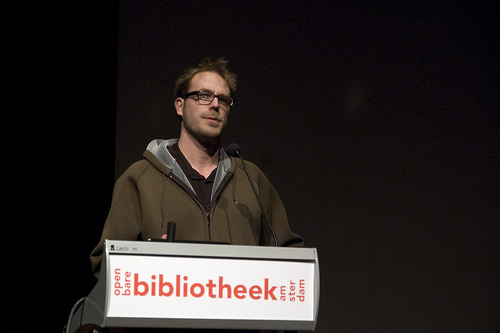 Van Beek explained that games were merely a framework in which people could make their own stories. Someone mentioned that the Amsterdam Filmacademy now have started a screenplay course for games, so maybe this will change in the future. The next speaker was Steffen Pauws from Philips Research Laboratories Eindhoven with the title how TV Watching Will Become an Experience. He presented some concepts related to the development of television. These days it is hard to stay alive as a company producing television technology and in order to survive you have to change the future of television. Pauws sees three major changes: television will be wireless, greener and thinner. But this turned out to be just to be a beginning and he continued with some ‘disruptive’ concepts. New features for television are to be found in the area of communication, entertainment, information and well-being, lifestyle. Pauws mentions in particular the 3D television that is not working with glasses, but is based on a lenticular display. This system requires an end-to-end approach where you have to alter the entire system. You need 3D content creation, 3D distribution, 3D play-out conversion and 3D visualization. The New Home Cinema is another project. The amBX home cinema system is a tool for gaming, home cinema and home atmosphere lighting. This lighting system is connected to the films you are watching. Scary scenes will give different lighting than friendly scenes. The accompanying video that shows a demo of this atmosphere lighting system is actually quite amazing and it would have been a good idea for this representation to involve some of the filmmakers skills, as earlier suggested by Bleecker. Another idea for this new television is to personalize the channels so you can easily find your favorite movie and share it with others. Also the tv could be used as communication tool for chatting and shared experiences with your family like watching pictures and homevideo’s. Necessary for this is to make the web accessible on the television set. Funny thing is that Pauw’s explanation more and more seems to describe something we already have, the computer! So actually they are searching for the functionalities of the computer but with the television as display. The amBX is already available for gaming. Philips is already with talking with possible partners for content creation and sharing. On the question why not just adapt the computer instead of the television Pauws replied that the average television watcher in America is over fifty. For this kind of target groups this new, easy to use television display is developed: people who just know how to work with a remote control and not a mouse. And after all, the television is just a display with a tuner, and the next tuner, is the internet. After the great free lunch Ton Roosendaal from Blender showed their recently finished Big Buck Bunny . 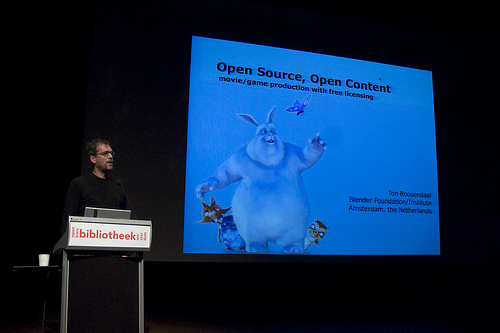 Blender is a company that develops free and open content media with open source. The animation film is made with the free downloadable Blender 3D suite and is developed partly by volunteers. The Blender foundation is founded in 2002 and is an independent public non-profit corporation. Their main goal is to make 3D tools and technology for independent and small teams of artists in order to realize creative projects and to improve the 3D open source software. According to Roosendaal open source works, sharing works, you can do things together, making things together. It is based on a notion of shared self-interest. For the realization of these kinds of projects public money is available in the area of education, public knowledge and the Dutch animation industry and they work with commercial partners. The DVD of the film is sold in advance and also this source of income is used for production. Roosendaal argues that he enjoys this way of working. It is independent, you have artistic freedom, you can create a great portfolio, learn new techniques and work with the best people. 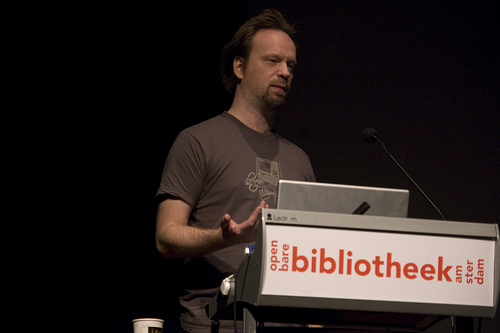 The first open source film created by Blender is Elephants Dream (2006). Elephants Dream is a computer-generated movie made by a team of seven artists and animators from around the world. Yo Frankie is an open game content where Blender tries to develop a game without the use of programmers. This way maybe the content of games can change too because the ‘boys’ that usually program, make what they: shooting. So Roosendaal expresses the hope that with a different kind of makers a different sort of games will get developed. For their new film visual effects project Blender is looking for partners. And, if you are a movie maker, go to www.blender.org and download the new software. You can use it, you can keep it, you can sell it, and you can share it but you don’t have to. The next speaker, Matt Hanson (UK) unfortunately couldn’t be present today since his passport got stuck at the Indian embassy (…) . This was a shame while his project Swarm of Angels http://aswarmofangels.com/ is very much related to the Blender activities in the sense of open content development. Floris Kaayk (NL) is an artist and filmmaker and graduated at the Sint Joost Academy in Den Bosch and the Sandberg Institute in Amsterdam . He shows two of his animation projects. 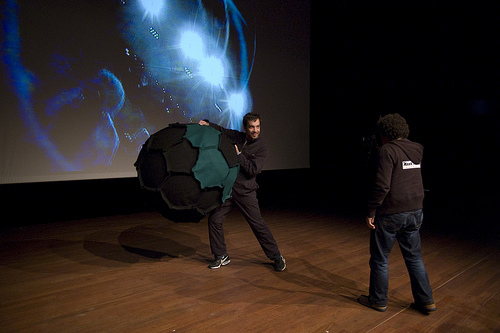 The first film is developed during his third year at the Sint Joost and consists of insects built out of computer and electricity parts. The animation is based on an insect book where he made illustrations for insects like the Tandwielwantsen and the Stekkerstaart. The animation is recorded in the Ruhrgebied, an old industrial zone in the West of Germany. Kaayk explains he likes to see his fantasy projected in the real world. For this reason, his film is in the form of a nature documentary with a serious voice over as we know it from the BBC nature-film genre explaining how the insects are killing each other and giving a ‘glimpse of what was going on in an industrialized nature’. The second project Kaayk is showing us is Metalosis Maligna. This cyborgian nightmare is again a ‘mockementary’ but this time humans are involved. The disease Kaayk invented for this film is causing metal tissue growth around the area of body implants. In severe cases the tissue even becomes external to the body and sections of the original body disappear completely. The disease can start and stop at its own decision and the length of the disease differs from person to person. The film is recorded in Edinburgh and has extraordinary visuals. Kaayk is responsible for the technical realization. It took him four months to figure out how he wanted to visualize the metal tissue growth on moving footage. Amazingly enough, Kaayk made these two film with almost no budget. For his next project he found founding from the Amsterdam Film Fonds and the Rotterdam Film Fonds. This next project is not in the documentary genre and consists of assembled body parts forming some sort of new organisms that only function when they start to combine. Interesting was to see how Kaayk develops an idea from the level of the ‘hobbystore’ and translates this finally into software solutions. Kaayk’s work shows how an artist can develop his own artistic vision and technical development at the same time. 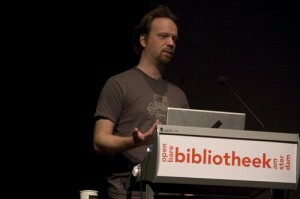 And next time, he could use the free Blender software, instead of the expensive Maya, as Koert van Mensvoort suggested. Then it was time for a special intervention! Roel Wouters demonstrated the Jubilator! 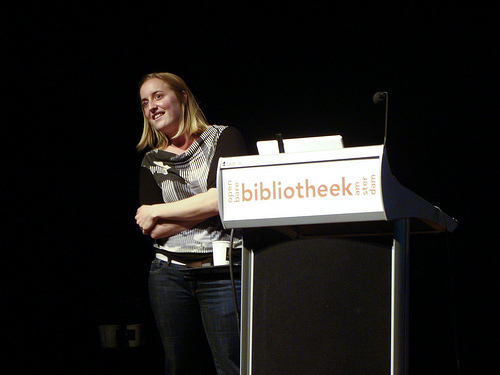 After this nice commotion Anne Helmond, a blogger and lecturer at the University of Amsterdam, introduced the problem of being addicted to your blog. She explained how blogging is for her part of the daily routine and an important part of her online presence. An major aspect of this routine consists of checking the stats. ‘It’s like with stocks’ she explains, ‘when they keep rising it is fun to check, but when they drop, you rather avoid looking at them at all because they depress you’. But, you still can look at the other stats: they show you who your visitors are, where they come from. It shows the network. Also you can see the postdates, you can see how old your latest post is. And if this is 11 days old, it can make you feel bad, as if you are neglecting your blog, cheating on it. Which you actually are! Confronted with your latest post, a notion of freshness is created: you should post at least once a day, the machine forces you to blog. Helmond shows us a wired infograph where you can see what happens when you post your blogpost. It shows the network it is embedded in, the life circle of a post, the form. Your blog is constantly searched by engines, so if you don’t have time to write, you start making apologies to your blog for not writing as if it is a living being. Helmond showed us that with the site We Feel Fine that she is not the only one who is bothered by these kind of feelings and behavior. In just a short time span she found about a 1000 online remarks that people use rather intimate language when expressing themselves about neglecting their blog. They used words like cheating and apologized for ‘writing for a bigger blog now’. This feels like we can compare a blog to a diary. But this isn’t the case according to Helmond, since a diary is intended to be private, locked away in as safe place and a blog is intentionally made public. Even more, a blog links automatically and a diary doesn’t. Helmond also showed the LED-screen installation by Ben Rubin and Mark Hansen, located on the ground-floor lobby of The New York Times Building in New York City. The daily output of the paper (news, features, editorials) and the archives, as well as the activity of visitors at www.nytimes.com (browsing, searching, commenting) are on 560 vacuum-fluorescent display screens installed in the lobby. Here the blog is used as a database and according to Helmond this is also the direction the blog will be heading in the near future. Not as a diary but as a database where you can read information. Most amusing was the Japanese video about the blogging plant. They measured the juices inside and translated this to Japanese. Do plants have emotions or conscientiousness? Well indeed they have and they even blog now too. A question from the audience addressed the Wired article where lately was announced that blogs were ‘over’. Well, according to Helmond this is not that much the case. Blogs are not over, but they just change. They turn into something like content management systems or in journals or in magazines. The personal blogging the way it was around 2004 is over now. Blogs are part of a network and parts of that network are automatically traced by search engines. Bruce Sterling adds on to this that he thinks that they should give a Nobel Prize for the person who finds a new buzzword for the blog to replace the out-of-date ‘web-log’. For some people twitter is the new buzzword but to Helmond Twitter is just a supplement to blogging, a form of microblogging. For her, the blog is her cv, her resume, her portfolio online and blogging turned into her job. 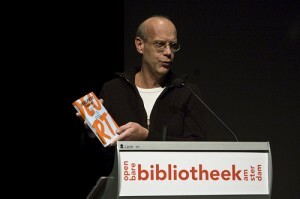 The last speaker was Geert Lovink, media theoretist en activist, founder of Nettime and the Institute for Network Cultures. According to Lovink we looked today at moving image too much from the perspective of the film industry and we should not have been looking at the new media developments and the Internet, like Youtube, as a threat. We should welcome the film industry into the Internet instead. 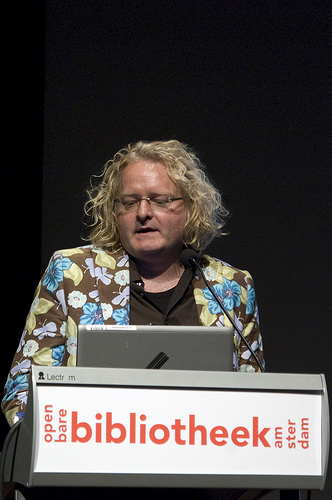 While talking, Lovink shows a hilarious non-stop Youtube videoslam compilation (to be found here) on the big screen with such disruptive and funny moments that big parts of the audience is seriously distracted. According to Lovink we better get used to today’s visual culture and we need to take this seriously in order to develop a set of vocabularies so we can increase the language to talk about these kind of things we love to look at: ‘what we are trying to achieve together with a lot of people worldwide is to define, what exactly the extra is, and how this is different from television so we can get beyond the question of remediation. We need to understand the network nature of this new visual culture. We are leaving the living room and enter the social environment. This is an important notion because the medium is deeply social. It is changing a lot in a very short time, Youtube is only a few years old!’ VideoVortex is contributing to this discussion with conferences in Amsterdam, Brussels and Ankara. Another aspect is that since we all have camera’s in even our cellphones, video is becoming a disposal product. ‘We are getting used to small video fragments and need to start to understand what it is to use the videophone and what it means to actually use the moving image. The richness of this visual cutlure will have a major implication on our messy daily lives’ (as was beautifully demonstrated by the ongoing videoslamming). An influential person for Lovink and someone who has predicted and theorized this development is the media philosopher William Flusser. In his writings he goes really deeply into this change of the media structure and what media is actually about. Flusser thinks that they have the potential to be dialogical but don’t fulfill this promise completely. The open structure of media comes in play here. Flusser also makes an important distinction between where media just can be operated and where they can be programmed. It is important to see where we can intervene and contribute in the structure of these devices. Personlized media like the Iphone turn the users into operators so these people see themselves as media savvy. It is important to remix material, you have to start to play with it, remixing it in some context. Remixing is already seen by some as user generated content and it is important to see the different between this very loose way of using the a camera. This is the topic Networkcultures has embarked on with the Videovortex network and they are looking at how artists and curators are reacting on these kind of developments. Lovink stresses that the main object of Anne Helmond’s research is how bloggers start to realize they are ‘working for google’ and contributing to a huge database. They will start to contribute to the cloud, slave for the cloud. And Youtube is off course owned by the Google cooperation and with clever tagging and viral marketing we contribute. Maybe the bloggers stop if they realize they have not enough to say. Lovink ended this interesting and nice conference with the remark that according to McLuhan, we are looking in a rearview mirror in order to try to understand the past. And then, there were the drinks! 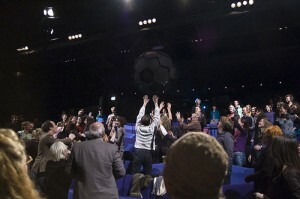 Paulien Dresscher » Blog Archive » IDFA: Doc Lab Live Screenings or the Googlization of the Cinema? Masters of Media » IDFA: Doc Lab Live Screenings or the Googlization of the Cinema? My brother suggested I would possibly like this website. He used to be totally right. This publish truly made my day. You can not believe just how a lot time I had spent for this info! Thank you!